Our intention has been to write a book that would be useful to people with a variety of levels of interest in this subject. Clearly it should be useful to both graduate students and workers in the field. We have attempted to bring together many of the concepts used in channeling beam analysis with an indication of the origin of the ideas within fundamental channeling theory. 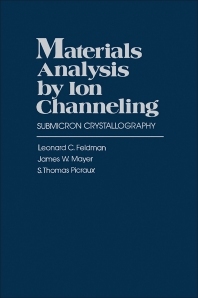 The level of the book is appropriate to senior under-graduates and graduate students who have had a modern physics course work in related areas of materials science and wish to learn more about the "channeling" probe, its strengths, weaknesses, and areas of further potential application. To them we hope we have explained this apparent paradox of using mega-electron volt ions to probe solid state phenomena that have characteristic energies of electron volts. Preface. Acknowledgments. Glossary of Symbols. Introduction. Interaction of Ion Beams with Surfaces. Channeling within the Crystal. Particle Distributions within the Channel. Dechanneling by Defects. Defect Depth Distributions. Surfaces. Surface Layers and Interfaces. Epitaxial Layers. Impurity-Defect Interactions. Appendix A. Atomic Scattering Concepts. Appendeix B: Lecture Notes on Channeling and the Continuum Potential.